The Canadian Horse Racing Hall of Fame is pleased to announce the people and horses being recognized as inductees in 2019. Six people and four horses have been elected from an extremely deep ballot of candidates. The Induction Ceremonies will take place at the Mississauga Convention Centre on Wednesday, August 7, 2019. Standardbred inductees include Builder Ian Fleming, Driver Trevor Ritchie and Trainer Jimmy Takter along with horses Tricky Tooshie and Angus Hall. Ian Fleming’s career in the horse racing industry began as race secretary at his home track in Clinton, ON. 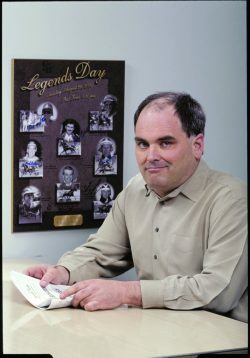 That evolved into managing the racetrack and from there he went on to create a centralized Race Office for several Ontario tracks in the 1990s, which now services racetracks across the province. Fleming was also the Racing & Gaming Manager at Western Fair Raceway for a number of years. His business prowess is based on cultivating relationships, and his deep knowledge and understanding of the mechanics of racing and wagering is world-renowned. Ian has helped every Ontario racetrack and many international organizations to shape and strengthen harness racing, and also volunteers his time in administrative capacities, sitting on the Board of Directors for Standardbred Canada and the Ontario Standardbred Adoption Society. In addition to his racing related responsibilities, he continues to find ways to give back to the industry and his community through fundraising initiatives such as the bi-annual Legends Day at Clinton Raceway. The 2017 edition of Legends Day hosted harness racing fans from across North America to witness John Campbell’s final career race. Ian was also an important part of the fundraising efforts following the Classy Lane Fire. 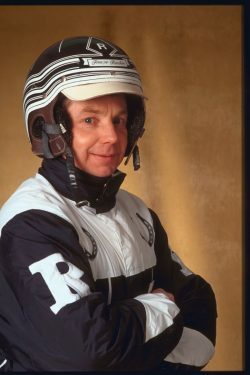 Before retiring from driving in 2014, Acton, ON based Trevor Ritchie won many of North America’s premier races including the North America Cup, Meadowlands Pace, Oliver Wendell Holmes, Prix d’Ete, Provincial Cup, Metro Pace, Canadian Pacing Derby, Trotting Classic Final for mares, and Champlain Stakes. During his career he had 3,710 driving wins and drove horses to over $70 million in purse earnings. 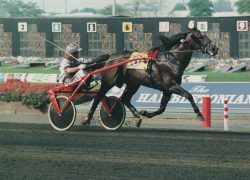 The year 2000 was a career year for Ritchie ashe won the Hambletonian with Yankee Paco, the first Canadian-sired horse to win that event. 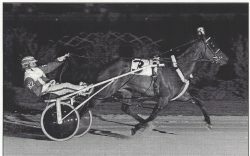 Later that year he won three Breeders Crown Championships, tying him with John Campbell as the only other driver in history at the time to accomplish that feat, and he was voted Canada’s Driver of the Year. Other top horses driven by Ritchie included Quite A Sensation, Frugal Gourmet, Road Machine, Armbro Agile, Peaceful Way, Majestic Son, Banker Hall, and Rotation. Ritchie’s quiet demeanor, immense talent, and great respect for his clients and fellow competitors served him well throughout his near 40-year driving career. 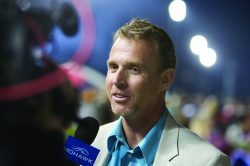 Swedish-born, U.S.-based Standardbred trainer Jimmy Takter has seen tremendous success on Canadian soil. With 1,325 starts in Canada, he has visited the winner’s circle 266 times and collected purse earnings of more than $34.2 million. Takter has won 103 stakes races on the Woodbine Entertainment Group (WEG) circuit. Horses trained by Takter have won a total of 19 O’Brien Awards, including at least one O’Brien Award in 15 of the 19 years between his first award in 1999 with Moni Maker and his most recent with The Ice Dutchess in 2018. Despite being based in New Jersey, Takter was Canada’s leading trainer by earnings in 2015 with over $4.2 million made in Canada and has ranked among the nation’s top 10 conditioners six times since 2011, including second-place finishes in 2014 ($2,643,455) and 2016 ($2,263,361) Takter has also trained for a long list of prominent Canadian owners, including five members of the Canadian Horse Racing Hall of Fame: John Fielding, Marvin Katz, Al Libfeld, Charles Armstrong (CHRHF), Dr. Glen Brown (CHRHF), Herb Liverman, Bob Anderson (CHRHF), David Anderson, David Willmot (CHRHF), Lou Camara, John Florens and Peter Heffering (CHRHF). Tricky Tooshie was bred and owned during her racing career by Laurent Bergevin of Québec. Trainers included her co-breeder Jean L. Deblois, followed by Rick Zeron and then Linda Bedard. As a two-year-old she raced in Québec where she dominated the Québec Sires Stakes, was the divisional leader and won the $197,000 Coupe des Eleveurs final at Blue Bonnets in a track record 1:55.1. As a sophomore she once again dominated her division in Québec. After a second place finish in her first start, she then reeled off 15 consecutive wins including the $177,000 Coupe des Eleveurs and several Québec Sires Stakes. She won 15 of 17 races at six different tracks, almost $300,000 in purses and was a finalist in her division for an O’Brien Award. In seven years of racing she made 142 starts for a 44-29-24 record, posted a mark of 1:52.1 at Woodbine Racetrack and earned $1,005,566, becoming the first Canadian-sired mare to reach $1 million in earnings. As a broodmare, 11 of her 13 foals made it to the races to earn over $3 million for average earnings per starter of $284,441. Her richest foal was True North Hanover, a winner of $732,912. As a racehorse Angus Hall earned $830,654 in 26 lifetime starts and took a mark of 1:54.3. In 26 lifetime starts over two racing seasons, the regally-bred son of Garland Lobell – Amour Angus, bred by Québec’s Ferme Angus, won eight races and finished in the top three in all but four outings. He was the first two-year-old trotting colt to break the 1:55 barrier, winning in 1:54.4 at Colonial Downs. Angus Hall has sired over 1,700 horses during a stallion career spanning 18 years, with 71.5% of his foals having race careers. His offspring have earned over $102 million, and include six millionaires: 2008 CHRHF inductee Peaceful Way, Majestic Son, Elusive Desire, Winning Mister, Frenchfrysnvinegar and Laddie. His contribution to trotting bloodlines continues through top broodmares whose offspring have earned over $45 million. Based in Alberta, the late Bory Margolus was a successful business executive who would also become a leading force in Western Canada’s thoroughbred racing industry. 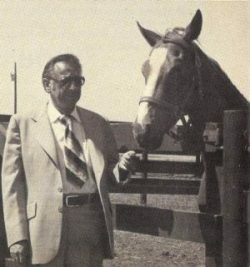 From the time he purchased his first horse in 1952 until his retirement from the industry in 1986, Mr. Margolus and his Elmbrook Farm near Edmonton were dominant in Alberta as leading money-winning owner for nine consecutive years. Elmbrook’s racing success channelled into its breeding operation, leading all Alberta breeders from 1980-1983 inclusive. His contribution was recognized nationally in the form of two Sovereign Awards – in 1975 as Canada’s Oustanding Owner and in 1977 as Outstanding Breeder. Margolus won every major stakes race in Alberta including the Alberta Derby, and also frequently raced his horses in British Columbia. He later partnered with CHRHF member Jim Wright in the ownership of Winnipeg’s Assiniboia Downs. Bory Margolus’ was known as a consummate gentleman who treated his horses and those he employed the same way, he spoiled them. Since establishing her own stable in 1994 Josie Carroll has accumulated 796 wins, including 44 graded stakes in both Canada and the USA and earnings exceeding $44.8 million in 4,786 starts for owners the likes of CHRHF Honoured Members John G. Sikura and Eugene Melnyk, as well as Ivan Dalos, Padua Stable and Donver Stables. 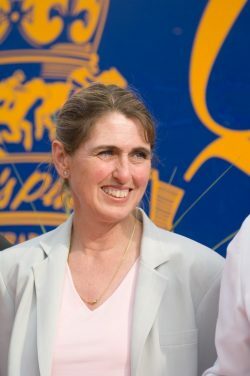 Carroll is the first female trainer to win the Queen’s Plate, doing so in 2006 with Edenwold (2-year-old Champion in 2005) and again in 2011 with Champion filly Inglorious. She also had a second place finish in the 2014 Plate with Ami’s Holiday who went on to win the prestigious Breeders’ Stakes. In 2009 her trainee Careless Jewel brought her a trio of Graded Stakes wins in the U.S. with the Alabama (G1) at Saratoga, the Delaware Oaks (G2) and Cotillion Stakes (G2). Other significant horses in Carroll’s career include Ami’s Mesa, 2nd by a nose in the 2017 Breeders Cup Sprint(G1) and a G2 winner in Pennsylvania, Ami’s Gizmo, winner of the Prince of Wales Stakes, Ami’s Flatter, winner of the 2016 Commonwealth Stk (G2) at Keeneland. Most recently Carroll trainee Avie’s Flatter won the G3 Transylvania Stakes at Keeneland. Three Carroll trained horses are finalists at the upcoming Sovereign Awards – 2-year-old Avie’s Flatter, older female Gamble’s Ghost and female sprinter Moonlit Promise. Bred by late Hall of Fame Builder Dr. Michael Colterjohn’s Paradox Farms, in Caledon, ON, Sligo Bay-sired Lexie Lou was purchased in the 2012 CTHS Yearling Sale by Owner/Trainer John Ross who directed her 2-yr-old campaign of 8 starts at Woodbine, including stakes wins in the Muskoka Stakes and South Ocean Stakes. Following her first start as a 3-year-old, U.S.-based Owner Gary Barber purchased the filly and moved her to trainer Mark Casse’s stable. 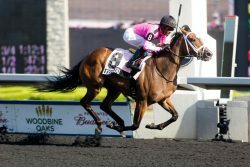 Lexie Lou established herself as the best filly in Canada by winning the 2014 Woodbine Oaks, and Queen’s Plate becoming only the 6th filly to complete the Oaks/Plate double. Her first turf race and victory came later in the Wonder Where Stakes. She was named 2014 Sovereign Award Horse of the Year, Champion Grass Horse and Champion 3-yr-old Filly. Additional races of note include a graded stakes win in the G2 Autumn Miss Stakes at Santa Anita and a second-place finish to U.S. HOY California Chrome in the G1 Hollywood Derby at Del Mar. Following time off in 2015, she came back as a 5-yr-old in 2016 winning both the G2 Nassau and G2 Dance Smartly Stakes to earn the title of Sovereign Award Champion Turf Female. French-bred filly All Along (FR), trained by Frenchman Patrick Louis Biancone and ridden for most of her career by Walter Swinburn, was the first winner of the Prix de l’Arc de Triomphe (G1) to race in Canada winning the 1983 Rothmans International (G1) as part of a 41 day international tour that also included wins in the Turf Classic (G1) at Aqueduct, NY and the Washington, D.C. International (G1) at Laurel, Maryland. Her 1984 campaign at age 5 included a fourth-place finish in the Rothmans International (G1) at Woodbine and a second-place finish behind upset winner Lashkari in the inaugural Breeders’ Cup Turf (G1) at Hollywood Park to conclude her race career. 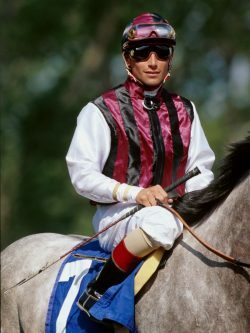 Named Horse of the Year on two continents, for owner famed art dealer Daniel Wildenstein and family, All Along (FR) was named Champion Older Horse in France and 1983 Horse of the Year in the U.S., the first female and foreign-based horse to win an Eclipse Award as Horse of the Year. At the time of her retirement following her 1984 campaign, All Along was the all-time leading distaffer in terms of career purse earnings with $3,015,764. 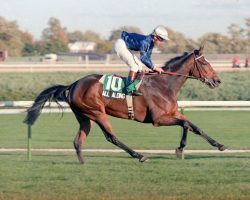 Her broodmare career produced 11 starters and 4 winners from 13 foals; the first in 1986 by Mill Reef (GB), called Along All (GB) being the most successful, a G2 winner. All Along (FR) died at Three Chimneys Farm in Kentucky at age 26 in 2005. She was inducted to the National Museum of Racing and Hall of Fame in Saratoga in 1990.